UCL has confirmed its position among the top 20 "super-elite" universities in the world, according to the Times Higher Education's (THE) annual rankings published today. UCL is ranked 16th in the world and fourth in the UK behind Oxford, which came first, Cambridge, which jumped two places to second, and Imperial College, London, which was eighth. LSE was 25th and King's College, London, 36th. The THE says the findings suggest a widening gulf between the "super-elite" and other universities as well as revealing London to be the top university city in the world with more universities in the top 500 than any other similar-sized conurbation. While Cambridge, Oxford, UCL, LSE and King's - what the THE dubs the "golden triangle" in the south east of England - have remained steady in the rankings this year (UCL is down just one place with Oxford, LSE and King's unchanged), several lower-ranked universities declined. The University of Warwick went down nine places to 91st and the University of St Andrews fell 33 places to joint 143rd. According to the THE, 16 of the UK's 31 universities in the top 200 dropped places. The results re-affirm UCL's status as a world-leading university following its seventh place in the QS world rankings (third in the UK) and its 16th placing in the ShanghaiRanking world tables (also third in the UK). It is the first time in the 13-year history of the THE tables that Oxford and Cambridge have taken the two top places. Cambridge's rise comes at the expense of the California Institute of Technology (Caltech), which was number one between 2012 and 2016 and is now joint third with Stanford University. The THE says the margins are extremely tight at the top with all the top-ranked institutions excelling across their 13 performance metrics. It suggests the rise of Oxford and Cambridge could be partly attributed to a significant increase in their income, up 24% and 11% respectively. However, it warns Brexit may pose a risk to the global performance of the UK's top universities. Almost a quarter of research funding from competitive grants at Cambridge and a fifth at Oxford comes from the EU. At UCL, it is 10%. 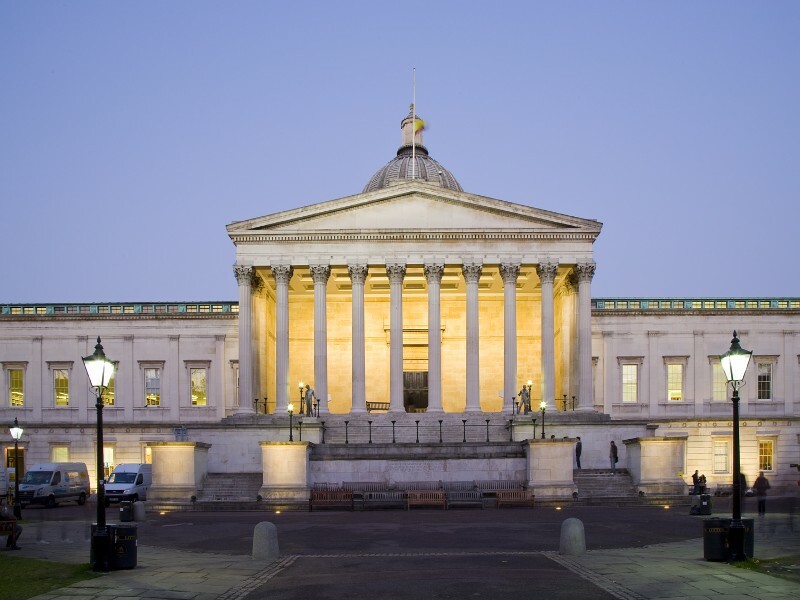 UCL President & Provost Professor Michael Arthur said: "I am delighted to see the continued success of UCL and of London as the top university city in the world with more universities in the THE's top 500 global rankings than any other city or similar-sized conurbation. It is a tribute to the hard work of all our staff and to our international outlook which means we attract highly-talented staff and students from the EU and globally." For the first time, there are two Chinese universities in the top 30 with UCL's partner institution Peking University 29th and Tsinghua University 30th. The US still dominates the top 200 with 61 universities followed by the UK (31), Germany (20), the Netherlands (13) and Australia (8). Phil Baty, editorial director of the THE rankings, said: "One thing this new data makes absolutely clear is that the UK has many of the very best universities in the world and it has one of the world's strongest higher education systems. "The data shows UK universities are consistently producing ground-breaking new research which is driving innovation, they are attracting international student and academic talent and are providing a world-class teaching environment. They are a huge national asset, and one that the country can ill afford to undermine at a time when its place in the global order is under intense scrutiny. "The rankings serve to highlight what is at stake if we cannot agree a sustainable way to properly fund our universities, we fail to welcome global students, and if the research funding and academic talent that current comes to us from the EU is cut off." He said the US dominance of the list had waned in face of the challenge from Asia, describing it as a real blow to the US higher education sector that it did not hold either of the top two spots in the rankings. "Funding concerns for America's public universities, uncertainty around future levels of research income and anti-immigration policies means that the US's position may decline further in future years," said Baty. "In contrast, Canada's universities may benefit if the country continues to become more outward in its worldview and increases funding for basic research. But whatever policies are implemented in North American countries there is no doubt that east Asian universities will continue to soar." In comments to The Evening Standard, UCL's president & provost Michael Arthur added: ""With Brexit negotiations now fully underway, these rankings are timely in reminding us of the important role our international staff and students play in our success. At UCL more than 21% of our academics are from the EU and a further 14% are from other non-EU nations. We draw our students from more than 150 countries. And such is the lure of the intellectual and cultural powerhouse that is London that at UCL we have seen an increase in the number of EU students due to join us on undergraduate courses this autumn despite Brexit. "People are uncertain and concerned by what will happen during and after Brexit. They are staying in the UK for the time being despite some evidence that some have already been approached to be poached by our international rivals. These EU staff and students who contribute massively to the UK economy need more reassurance and greater clarity from the government that freedom of movement to and from the EU for people of their calibre will continue after Brexit without bureaucratic visa restrictions. Equally, it makes no sense to include foreign students in the net migration figures given official evidence last month that the vast majority leave once their visas expire. "The government also needs to ensure science and research are included in the Brexit negotiations at an early stage and that the benefits of collaboration with EU and other international partners continues. It is welcome news if reports yesterday (Monday) prove correct that the government is prepared to continue to fund the EU's Horizon 2020 research scheme and any successor - and will shortly make this clear in a position paper. "Some 14% of UCL's research income comes from the EU including that from Horizon 2020. Of potentially more concern is the threat Brexit poses to money from the European Research Council (ERC) which brings in the very best academics from all over the world and accounts for about 45% of UCL's funding from the EU. If these sources of income were to be lost, it would threaten London as a world leader in higher education and as a research engine that helps drive the economy. "There are leading academics at UCL and in the UK today who joined as young EU researchers or post-docs. They are now responsible for work that pushes back the boundaries of knowledge, benefits us all and inspires the next generation. It would be a tragedy if we woke up in 10 or 20 years' time to discover those young researchers had turned their back on the UK because of a Brexit deal that failed to take account of our international outlook."